You must have heard it earlier: iBeacon is the most disruptive technology in recent times. While a lot of verticals are trying to get their hands dirty with beacons, others are still figuring out if they should be trying beacons. Whatever stage they are in, very few are totally aware of the ‘what’ and ‘how’ of beacon deployments. In this blog, we will look at some famous verticals that are exploring beacons, and some significant challenges they face while doing so. The questions here are those that came from our clients piloting beacons for retail, events, museums etc. 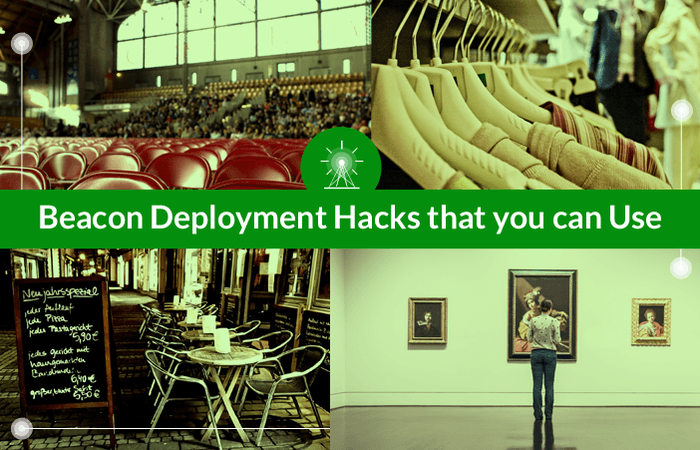 In the end, we also have some tips and tricks to make sure your beacon deployment process goes smoothly. Question: A large-scale event, say, a music concert could be spread across acres of space. How and where do we install beacons in such cases? It is impractical and unreasonable to install beacons across the whole event area as that would mean installing thousands of beacons. This would neither be cost-effective nor easy to manage. In such situations, it is important to ‘spot’ the ‘best locations’ for beacon installation. 1. Choke Points – The ‘entry’ and ‘exit’ doors at an event venue are referred to as choke points. These are points that each attendee will definitely cross by default. Placing beacons at these points to send relevant information, offers, rewards, and to deliver event content is a win-win for both event managers and attendees, as it ensures definite interaction between the event management crew and its attendees. 2.Points of interest – Sections of an event venue that are most likely to attract more attendees, are referred to as points of interest. Say for example, the ‘live session’ area or the ‘auction of bands’ instruments’ area. By placing beacons at such spots, you can be sure to have the maximum outreach. What are the rules for managing beacons for an event? Question: My hotel has quite a few facilities such as the gym, cafeteria, restaurant etc., and these are fairly close to each other. I want to send offers from each of these to my customers, without annoying them with too many messages. Also, I don’t want them to miss out on additional offers they might be interested from any of these facilities. How do I deal with this? The best way to deal with this is to place one beacon for a cluster of sections within a facility, such as the entrance, cafeteria. Message about a particular section can be triggered based on the direction from which a guest enters the beacon range. Beacons calculate the distance and detect the direction in which a guest approaches each section and use this data to trigger a message related to that section only, via the app. Although, all beacon platforms provide for messaging, there are very few (Beaconstac, for example) that allow for multiple messaging. This means that the same beacon can trigger a variety of messages, based on the conditions set in the app management platform, triggered according to the information on the app. What is ‘multiple messaging’ via beacons? Question: How do I place beacons in my museum, without adversely affecting the aesthetics? Most museum curators approach us with this question in their mind. Museums by default, emphasize on the importance of art above everything else. Maintaining a sense of aesthetic is thus of supreme importance. It’s best to go ahead with a beacon agnostic platform, that gives you the liberty to use beacons from any manufacturer. You might want to use beacons from one manufacturer in one section and from a different manufacturer in another section. Each manufacturer generally has a limited number of colors and shapes to choose from, so you would like to mix and match beacons from different manufacturers according to the art pieces, interior design, color of walls and architecture of each section. Beaconstac, for instance is one such platform that is beacon agnostic. How do I place beacons in my museum, without adversely affecting the aesthetics? Question: I know I can push offers to customers in my retail store. Is there a way I can engage with potential customers passing by the store? A very good way to do this is to install beacon-enabled mannequins in your store. These mannequins detect when a user is closeby (in-store or looking at a window display) and provides them with information about the various brands adorning it, related offers as well as where it can be found within the store. This way, you can not only engage your customers in-store, but also attract passersby with interesting offers sent out via your app. Setting up a campaign like this is extremely easy and can be done in a matter of a few minutes. If you are planning a beacon pilot, take a look at Beaconstac, that includes everything you need to get started. Using Beaconstac you can set up your own campaign, without a developer’s help! Question: Malls have wide passageways and can get very crowded on weekends. Beacon signals are radio waves and can be easily affected by interference. How do I deal with this issue? This can be an issue in wide open spaces that get crowded. The best way to deal with this is to place two beacons at a lower range rather than one beacon at a high range attempting to cover the entire area.This ensures better coverage and more consistent events. It’s true that humans can often act like effective radio frequency shields. A single beacon in the centre of a wide walkway would often not be picked up if a user has his/her phone in the pocket. Having one beacon on each side of the walkway is a more reliable solution. 1. Program your beacons before actual deployment: Configuring/programming a particular beacon for your campaign, with rest of the beacons lying in range can be quite a task. This is because the other beacons can disrupt signal efficiency of the beacon you are trying to configure. Tip: Keeping your beacons in a microwave can help prevent them from broadcasting signals while you test and program other beacons. You can use metal tins too, to contain beacons while you program one of them. The tins help block the signals of unassigned beacons sitting inside, which otherwise, can be a very confusing process to deal with. 2. Using a ladder for beacon installation may not be the easiest way to do it: For buildings with high ceilings, placing beacons near the roof is quite a task. Using a ladder can be quite tedious as you have to carry it around, climb on it etc. Tip: An easier and a more convenient option can be a custom made long stick with a grasp tool. Something that can reach of up to a height of 15m or more can be your secret weapon! Though you will be faced with a few problems while deploying beacons, you will be happy that you chose the beacon path in the long run. Did you find this blog helpful? Let us know in the comments below.